On Chat Enterprise, you can create your own custom chat roles and assign those roles to any agent. Custom roles enable you to define agents' responsibilities, so they align with your organizational structure and workflow. Custom roles are used in conjunction with default roles. For information Chat default roles, see Understanding default roles in Zendesk Chat. 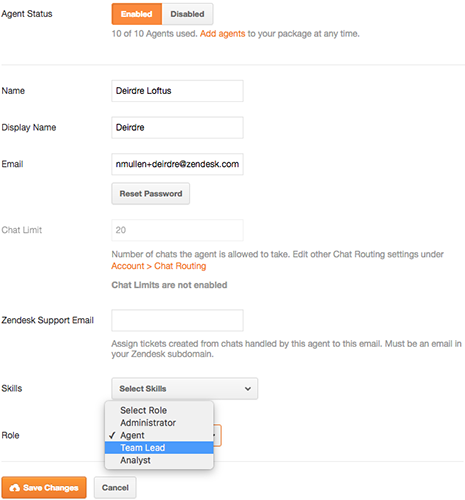 Zendesk Chat offers three predefined roles: owner, administrator, and agent. Each role is permitted access to different Chat features and functionalities. The owner and administrator roles are not customizable. You can customize the agent role permissions, but these settings will be applied to every user with the agent role. If you would like to assign different sets of permissions for individual agents, you will need to use custom roles (see Creating custom roles). For details on adding agents in Zendesk Chat, see Creating agents and departments. Below is an overview of the available predefined roles. For more information on the predefined Chat roles, see Understanding default roles in Zendesk Chat. Owner By default, the owner is the person who created the Chat account, but you can change the account owner at any time. In addition to agent and administrator privileges, the account owner can upgrade or downgrade the account's plan, change billing information, access invoices, and cancel the account on the Chat account management page. You cannot modify permissions for the owner role. Administrator Administrators have access to of all the same privileges as regular agents (see Chat role permissions). They can also edit settings in Widget and Account, manage agents, triggers, and departments, and delete chats from History. For Professional and Enterprise accounts, administrators can also use Analytics. You cannot modify permissions for the Administrator role. Agent Agents have restricted feature access. The owner and administrators can set their privileges in Settings > Roles > Agent (see Chat role permissions). While the agent role privileges can be modified, any settings you edit on the predefined agent role will be applied to all users assigned the agent role. If you would like to give individual agents different privileges, you will need to use custom roles. To apply unique permissions to different sets of agents, you will need to create custom roles. Custom roles can help you focus agents' workflow and align their privileges with their support responsibilities. Note: Custom roles are included in your number of allowed agents. From the dashboard, select Settings>Roles. Next to the Search box, click the Add Role button. Select the different permissions for the user role. See Chat role permissions below for descriptions of each permission. You can edit the role any time by selecting it from Settings > Roles. See Assigning custom roles to agents for information on changing an agent's role. When creating custom user roles, you can choose from a list of permissions to define what agents can do. User Information: Agents can edit visitor name, email, and phone. Notes: Agents can edit notes. Edit Chat Tags: Agents can add/remove tags for past chats in History. Visitor Banning Manage Visitor Bans: Agents can temporarily ban visitors via browser cookies while in a chat or manage more permanent bans by IP. Analytics Analytics and Email Reports: Agents can access Analytics and Email Reports under personal settings. Monitor View Monitor: Agents can view real-time metrics on Monitor across the whole account. Departments: Agents can edit department details and add or remove agents from a department. Agent Chat Limits: Agents can set chat limits for gents if agent limits are enabled. Shortcuts Manage Shortcuts: Agents can add, edit, and delete shortcuts that can be used by anyone while chatting with visitors. You can assign a role to an agent by editing their profile, or you can assign a role to multiple agents at the same time. Agents with the disabled status will not be enabled by changing their role. From the dashboard, select Settings > Agents. Select the agent you would like to edit the role of. You will be redirected to the agent's user profile. Click the Role field at the bottom of the profile and select a role. The agent role will be updated. From the dashboard, select Settings>Agents. Select the checkbox next to the names of the agents you want to update. 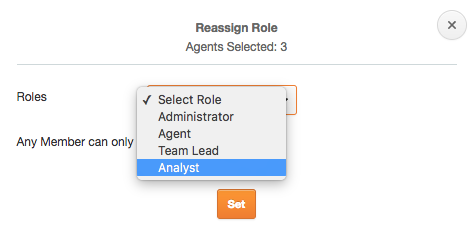 Click the Actions button above the agents list, then select Set Role. Select a role from the Roles drop-down list. The agents will be updated with the new role. All shortcuts: Can add and edit personal, department, and global shortcuts. Department: Can add and edit personal and department shortcuts. Personal: Can add and edit personal shortcuts. None: Unable to add or edit any shortcuts. For more information on shortcuts, see Inserting common phrases with shortcuts.